By George P. Slefo . Published on January 07, 2019. A P&G employee showing off its smart toothbrush, which connects to your phone. While CES officially kicks off Tuesday, with some 200,000 people from across the globe are descending on Sin City to see the latest in gadgets, gizmos and tech innovations, companies large and small are already holding closed door events to share news about their latest products. On Sunday, tucked away in a small room on the second floor of the Mandalay Bay Convention Center, Marc Pritchard, CMO at Procter & Gamble Co., pitched some 200 people about the company's latest bets on smart home care. 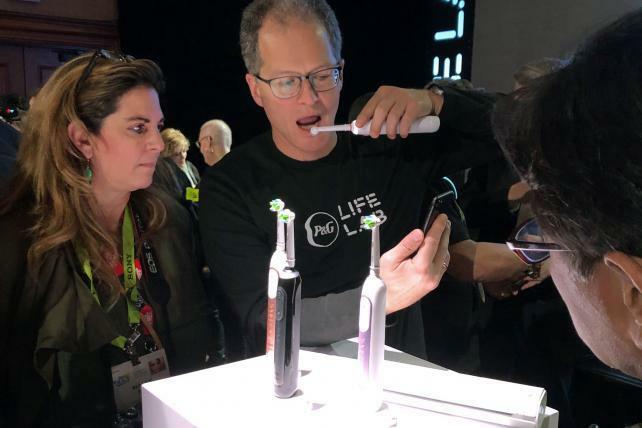 There's a Gillette razor blade that heats up in one second—so "it can give you the feeling of a hot towel shave without the barber," Pritchard said—and a smart toothbrush that connects to a consumer's phone. There are also products like the Opté Precision Skincare system, which uses a digital camera to help cover up unwanted marks – or "age spots" – using a fraction of the makeup women would normally apply to conceal such areas on their face. The company's investment arm—P&G Ventures—has placed roughly 130 bets on startups with hopes that one, or a few, will create the same sort of disruption that smaller direct-to-consumer brands have achieved. "More and more we are using the seed stage as experiments to perfect the products, and then we're using the direct-to-consumer model to monetize and build the business in a range of ways," Pritchard told Ad Age. "[At CES,] we want to make new connections and disrupt our business in a constructive way." P&G is just one of many brands who are using CES to find startups that can help innovate their existing products. P&G's Opté, for example, developed some of its AI technology through "extensive partnering" with startups such as Funai Corp.
Over on the showroom floor, faucet and fixture stalwart Moen was showing off its products with Flo technology. Flo itself is a startup which received $28 million in additional funding from Moen's parent company, Fortune Brands Home and Security, as well as others. Flo's technology alerts users when they have a leak in their home and stops water from flowing to prevent damage. 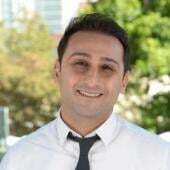 "Big companies are realizing they need to start making bets on these smaller tech companies," says Gabriel Halimi, co-founder and CEO of Flo. "The big companies want someone that is nimble and moves fast and the idea is that some of that startup mentality will rub off on them." Roughly 100 feet from the Moen booth was beauty maker L'Oréal, which was showcasing a device that can detect the pH balance on a person's skin. The idea is that measuring pH balance will prevent things such as dry skin or eczema, allowing one to apply L'Oréal products when such instances arise. "No one has been able to measure PH like this before," Guive Balooch, global VP of L'Oreal's technology incubator, told Ad Age on the CES showroom floor. "Before you had to go to a dermatologist and run on a treadmill and sweat to measure your pH." The product is still being tested and has yet to release, but to help L'Oréal even get this far the company had to partner with Epicore Biosystems, a startup that was originally working with outfits in the sports world such as Gatorade. Meanwhile, Schlage, one of the world's largest makers of locks, is also taking a similar approach at CES. Its parent company, Allegion Ventures, set up a $50 million venture fund to find startups that can innovate its suite of products. Last week, the company invested in startup Pindrop, which specializes in voice authentication technology, for an undisclosed sum. "We need to make sure we have our ear to the ground for the next big thing," a Schlage executive on the showroom floor said, adding that its parent company is having closed door meetings with innovators at CES. Still, Charles Moore, a former Walmart buyer who now consults for startups, says it's not uncommon for larger brands to fumble their execution when investing in an upstart company. He adds that it's best to let most startups grow organically rather than scale them right away. "Brands will come in and over compensate because they are a big brand," Moore says. "They think that they'll simply make it happen because they're a big brand and that's just not the case."